During adolescence, as teenagers transition into adulthood, they experience significant physical, mental, and emotional changes. The choices they make as they grapple with increased independence can have profound ramifications on well-being. Teens who become involved in unhealthy or risky behaviors—such as inactivity, unbalanced eating, substance abuse, unprotected sexual activity, or dangerous driving— may find themselves at risk for long-term, even life-long, health consequences. In addition, because social connections are so critical during the adolescent years, the demands of friendships, peer pressure, and other relationship stresses can complicate healthy decision-making processes. 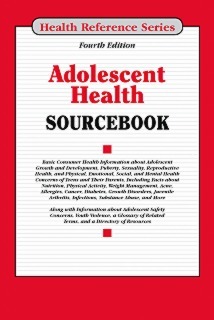 Adolescent Health Sourcebook, Fourth Edition, offers parents and teens basic information about growth and development during adolescence and related safety issues. It discusses the importance of routine medical care, adequate nutrition, physical activity, and sleep. It offers facts about reproductive development and the health consequences of sexual decisions. It also describes many of the most common health problems that affect adolescents, including acne, allergies, asthma, diabetes, and infections. Emotional, social, and mental health concerns—including depression, anxiety disorders, self-injury, suicide, and addictions—are also discussed. The book concludes with a glossary of related terms and a directory of resources for additional help and information. Part I: An Overview of Adolescent Health discusses the physical, mental and emotional components of adolescent well-being, and emerging issues related to them. Facts about brain development during the teen years, the role of risk taking during the transition to adulthood, and also includes the challenges of parent-teen communication. Part II: Staying Healthy during Adolescence explores strategies teens can take to promote good health. These include getting recommended physical activities, vaccinations, eating right, exercising, limiting caffeine use, managing weight, and avoiding sleep deprivation. Part III: Puberty, Sexuality, and Reproductive Health provides detailed information about gender-related concerns. For males, these issues include testicular self-exams, disorders of the testes, and gynecomastia (male breast development). For females, topics include menstruation and the menstrual cycle, breast and pelvic exams, and vaginal yeast infections. This part also offers information about sexual orientation, sexually transmitted diseases, sexual abstinence, birth control, and teen pregnancy. Part IV: Common Health Concerns of Teens and Their Parents discusses chronic health conditions that may affect adolescents. These include acne, allergies, asthma, cancer, diabetes, growth disorders, juvenile arthritis, and infectious diseases spread in schools. Part V: Emotional, Social, and Mental Health Concerns in Adolescents identifies stresses, pressures, and disorders that interfere with a teen’s ability to function at home, work, and school, including depression, anxiety disorders, attention deficit hyperactivity disorder, bipolar disorder, eating disorders, self-injury, obsessive-compulsive disorder, schizophrenia, tics, and Tourette syndrome. Information about the risk factors, warning signs of adolescent suicide and need for parental monitoring is also included. Part VI: Substance Abuse and Adolescents provides information about why teens are susceptible to addiction and discusses risk factors and treatment strategies for the most commonly abused substances, including nicotine, alcohol, marijuana, prescription medications, and inhalants. Part VII: Adolescent Safety Concerns offers advice on preventing adolescent injuries and accidents. Teens and parents will find information on reducing the risk of motor vehicle accidents, avoiding online sexual solicitation and electronic aggression, and averting problems with body piercings, tattoos, and other skin issues. Tips on staying safe at work and preventing sports injuries are also included. Part VIII: Violence against Adolescents identifies factors that protect teens against violence, such as family support, academic achievement, and community infrastructure. Adolescent aggression, which may take the form of bullying, hazing, choking games, dating violence, abusive violence, sexual assault, and gang-related activity, is discussed. This part also includes suggestions for families dealing with the aftermath of violence and trauma. Part IX: Additional Help and Information provides a glossary of important terms related to adolescence. A directory of organizations that provide health information to teens and their parents and a list of hotlines and referral services specifically for teens in trouble are also included.